In the 1920s, the richest people per capita in the world were members of the Osage Nation in Oklahoma. After oil was discovered beneath their land, they rode in chauffeured cars and lived in mansions. Then, one by one, the Osage began to be killed. Mollie Burkhart watched as her family became a prime target. Her relatives were shot and poisoned. Other Osage were also dying under mysterious circumstances, and many of those who investigated the crimes were themselves murdered. As the death toll rose, the case was taken up by the newly created FBI and its young, secretive director, J. Edgar Hoover. Struggling to crack the mystery, Hoover turned to a. former Texas Ranger named Tom White, who put together an undercover team, including a Native American agent. They infiltrated this last remnant of the Wild West, and together with the Osage began to expose one of the most chilling conspiracies in American history. Killers of the Flower Moon was the book club pick for my local book club in the month of January. It’s definitely outside of my usual reading pick. Despite that, I ended up getting engrossed in the story. This is a true crime novel and it totally blew me away. As I get older, I’m finding more and more stories that really should be taught in history classes. This was definitely one of them. The fact that this is something I’d never heard of before this book was incredible to me. This book tells the story of the injustices against the Osage Indians. They were used and abused and treated inhumanely. They were declared incompetent so that they couldn’t control their own money. They were made to move once, twice, three times before settling in Oklahoma on undesirable land. All of this was​ done by the government, by the American people. This is why it’s not talked about. Why would the government want to admit the horrible things they’d done and let happen to the Osage people? Treating them as less than people, not even allowing them to be in control of their own money, by doing these things, they allowed all of the horrible things that happened by regulating the Osage this way. This book is told in three parts. The first following Mollie Burkhart as the family she loves is dying around her, the second from the perspective of FBI Agent White, and the third from the author. I’m still a bit undecided whether or not I liked this. I definitely liked the first two parts. It was interesting to see how it all started from Mollie’s point of view and then to see how it was all wrapped up from White’s point of view, but then the author comes in and says, “Oh you thought it was over? Jokes on you, there’s SO much more.” I liked how it was written, I think I’m just bothered by the ‘but wait, there’s more’ twist. I know it’s not really a twist because it’s literally our history and this is not a plot twist in a fiction novel. I was just very unsatisfied with the idea that there was so much more to the story that no one did anything about despite knowing about it. 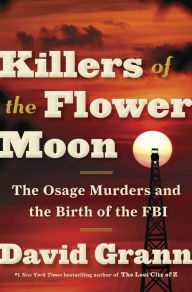 Killers of the Flower Moon tells of countless injustices against the Osage people. It was incredible to me just the immense amount of conspiracy and corruption went on during this time. All of the people that should have been doing their jobs to help the Osage Indians did exactly the opposite of that. I’m just still reeling from the events I learned about and I finished this book over a week ago. If you have never heard of this story, you definitely need to read it.